Do your eyes often feel dry or irritated? Do certain activities, like reading or working on the computer, make your eyes feel scratchy? Are you wearing your contact lenses less and less because they are becoming uncomfortable? If you answer “yes” to any of these questions, you may have what Eye Care Practitioners and Doctors call Dry Eye Syndrome. It’s a common problem, but you don’t have to live with it. The term “dry eye” is self-explanatory–eyes that aren’t fresh, moist and comfortable. The problem affects many people, but postmenopausal women and people who wear contact lenses are particularly susceptible. The condition is related to the quantity and quality of your tears, which can be affected by numerous factors. Some possible causes include: disorders- such as acne rosacea, hormonal imbalance,and eyelid abnormalities, medications- such as antihistamines, decongestants and birth control, and irritants- such as exposure to air pollution or other environmental factors. Your eyes can become dry in centrally heated or air-conditioned rooms and on airplanes. Long stretches working at a computer can dry your eyes because you don’t blink as often as normal. Discomfort: Your eyes burn, sting, feel gritty or are sensitive to light. Foreign body sensation: You feel as if you have something in your eye. Redness: Bloodshot eyes always indicate a problem. Sometimes, it’s dry eye. Fatigue: Your eyes seem to tire easily, especially when reading, watching television or using a computer. Uncomfortable contact lenses: If you have mild to moderate dry eye, you may not know you have a problem until you try to wear your contact lenses, which can upset the delicate balance of tear production and distribution. People with dry eye sometimes stop wearing their lenses, but they may not need to. Relief is usually available. Is it dry eye or something else? If you think you have dry eyes, come and talk to us about arranging a review at our specialist Dry Eye Clinic. During your Dry Eye Clinic consultation we will ask you specific questions about your health history and your environment. 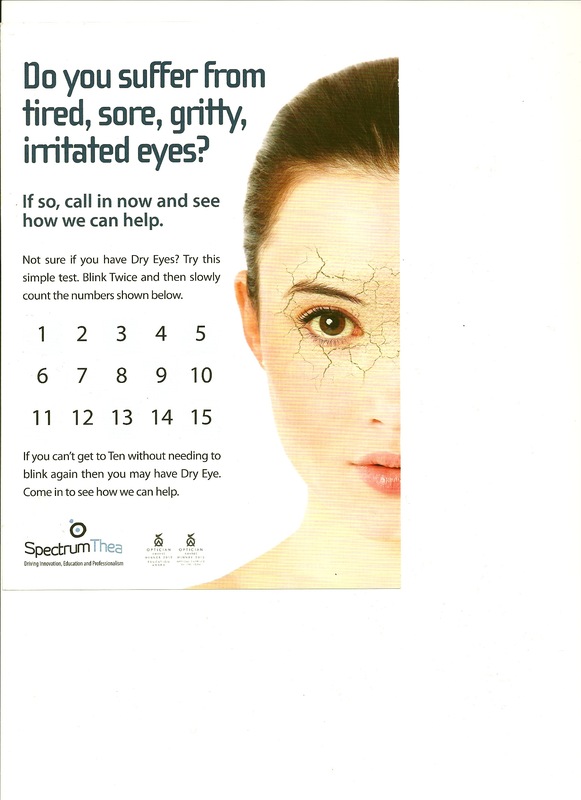 Our special “dry eye questionnaires” helps with the diagnosis of your dry eye issues. During your appointment we can perform some simple tests to determine your tear volume and composition. If redness and irritation are accompanied by itching and watering, allergies may be to blame. Our Optometrists can help with this, too. Environment. Fans or air conditioning vents can send a continuous air current across the surface of your eyes. Combine this with staring at a computer or TV, and it’s a problem. Add water. If the air is dry at home or at work, use a humidifier. Drink plenty of water, too, to hydrate from the inside out. Keep it clean. Steer clear of eye irritants, such as heavy pollution or smoke. That includes avoiding smoking (smokers are more likely to have dry eye) or being near people who are smoking. Give dryness the drop. Lubricant drops , also called artificial tears, work like natural tears to hydrate and restore the health of the eye’s surface. Try contact lenses made specifically for dry-eye sufferers. Yes, certain lens materials are design to help minimise the symptoms of dry eyes. Ask us about trying them. Use only the contact lens solutions your Eye Care Practitioner recommends. Your Eye Care Practitioner knows which lens cleaning and disinfecting solutions are compatible with the type of lenses you are wearing. If you stray from the prescribed solution, your eyes may feel dry and uncomfortable. Add moisture throughout the day. Rewetting drops can refresh your eyes throughout the day, even while you’re wearing your contact lenses. However, do ensure that the drops are suitable for use with contact lenses. Clean lenses properly. Follow Eye Care Practitioners instructions to care for your lenses. If you need a refresher course, you can find directions on the solution bottle or package insert or better still ask your Optical Hygienist. Clean lenses are less likely to irritate your eyes. There’s no need to live with dry, red, uncomfortable eyes. Ask us about our Dry Eye Clinic and how it can help you to get relief from your discomfort. If you are a contact lens wearer you should ensure that your eyes are benefiting from the healthiest and most comfortable lenses available. Perhaps it’s time to arrange a review for your eyes to enjoy the perks of recent contact lens technology advances.